The long-stemmed tulip glass has a pour of Einbecker Winter-Bock, a German doppelbock. In the stein is the Únětické Pivo 12°, a Czech lager. Notice East Liberty Presbyterian Church reflected on the tulip glass. 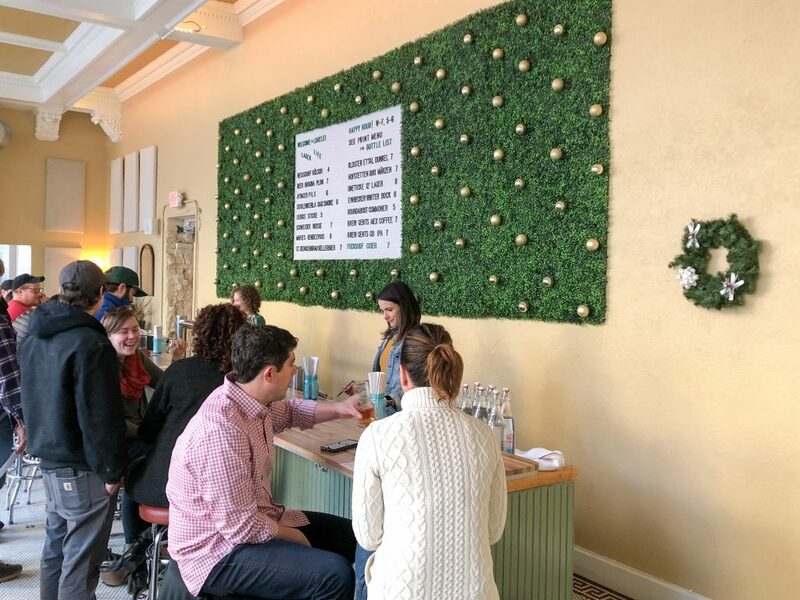 Lorelei opened to considerable buzz in 2018, and this year it only gets better as it continues to serve imported lagers, Alpine cocktails, and house-made food while also opening earlier on Saturdays for happy hour. 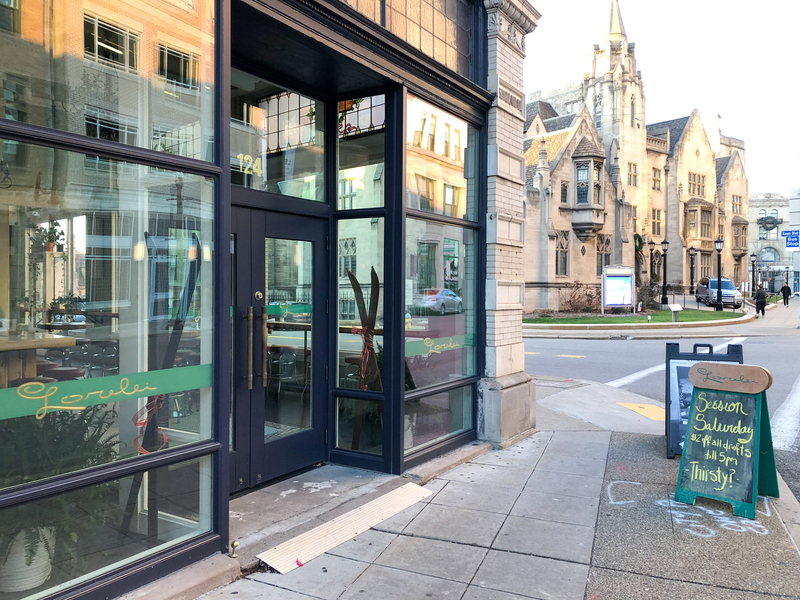 Lorelei officially opened Friday, July 27, 2018 in the Werner Building, partly where The Livermore, a cocktail bar, used to be. 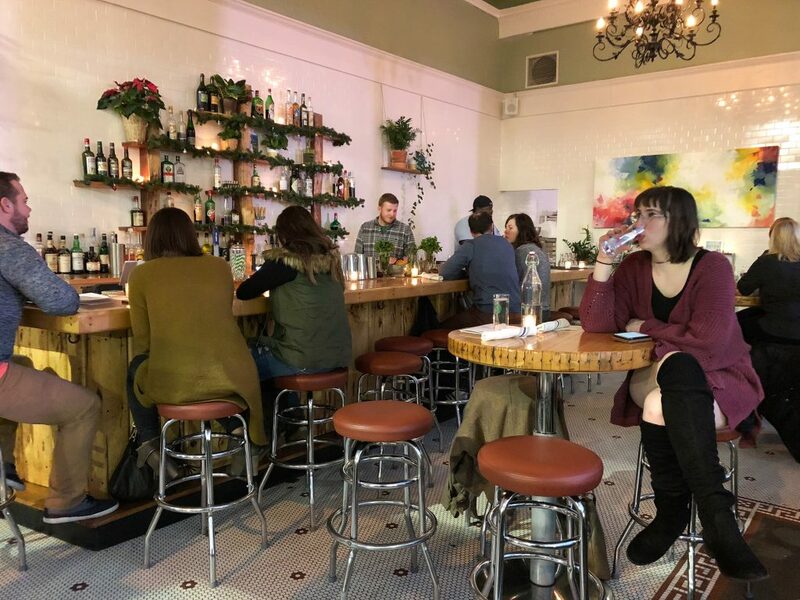 Independent Hospitality Group, which owns Lorelei, Independent Brewing Company, and Hidden Harbor, kept the old Livermore space a cocktail bar. But the group also acquired the room next door. 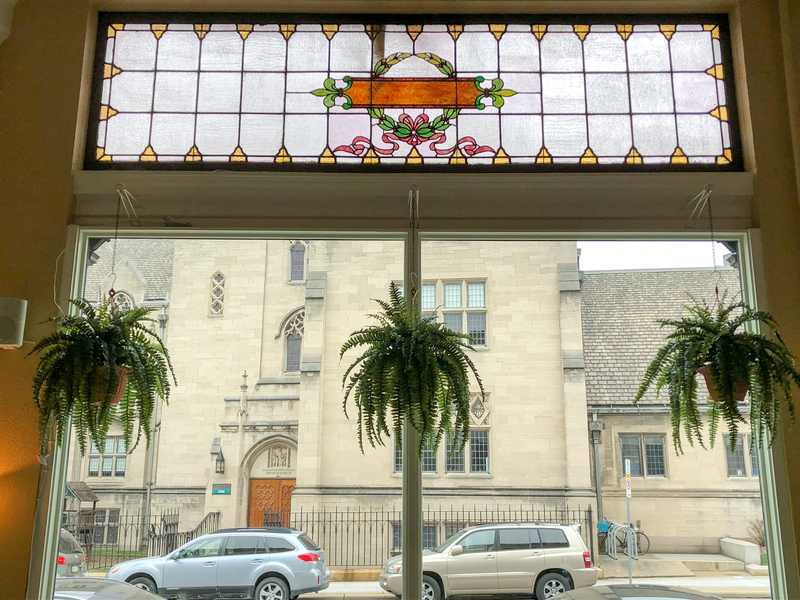 “The space felt like a beer hall to me,” Peter Kurzweg, co-owner and beer director, said, noting the neo-gothic architecture of the East Liberty Presbyterian Church across the street. Adam Henry, co-owner and cocktail director, then had the idea for Alpine-like cocktails to unify the themes. 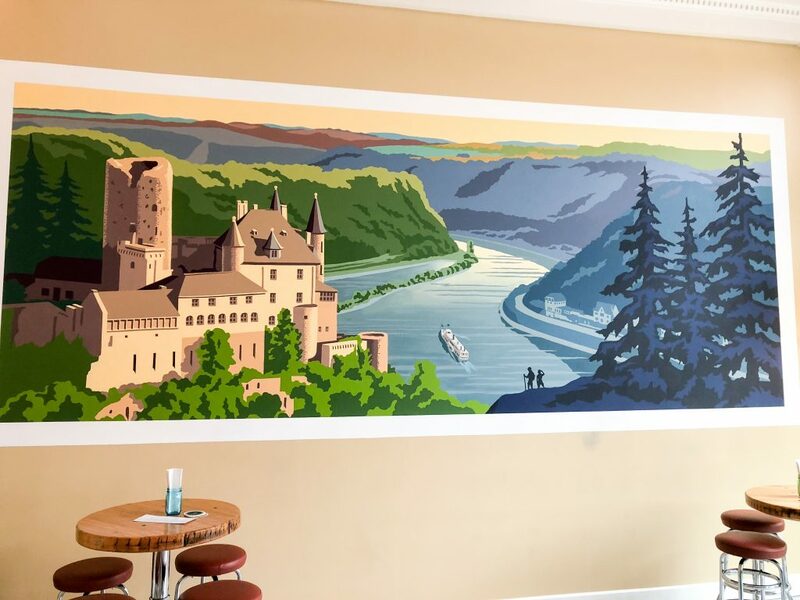 A vibrant mural of Germany’s Rhine River Valley enlivens a wall in the beer hall. “In the craft beer resurgence, the lager has largely been left behind,” Kurzweg said. 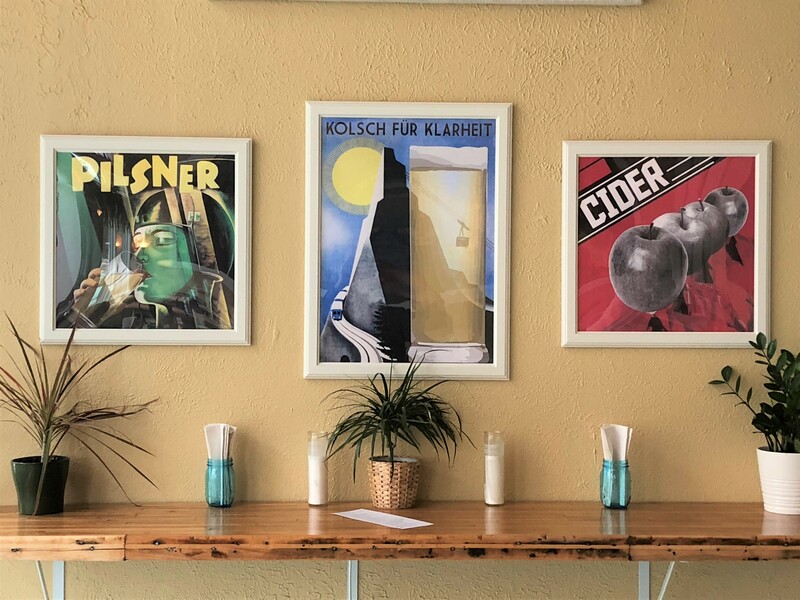 Thus, the hall specializes in lagers, on draft and in bottles, imported not only from Germany but also the Czech Republic. 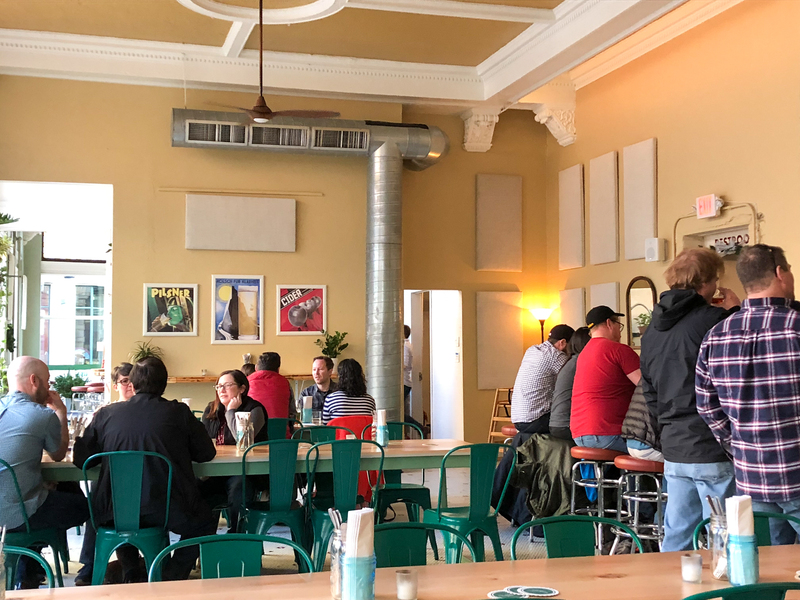 The beer hall at Lorelei opens 1 p.m. Saturdays instead of 5 p.m. Happy hour—$2 off all drafts and wines—starts then and concludes at 5. My girlfriend and I arrived at 4 p.m. on Saturday. The bar was crowded, so we sat by the floor-to-ceiling windows at a shared-seating table. 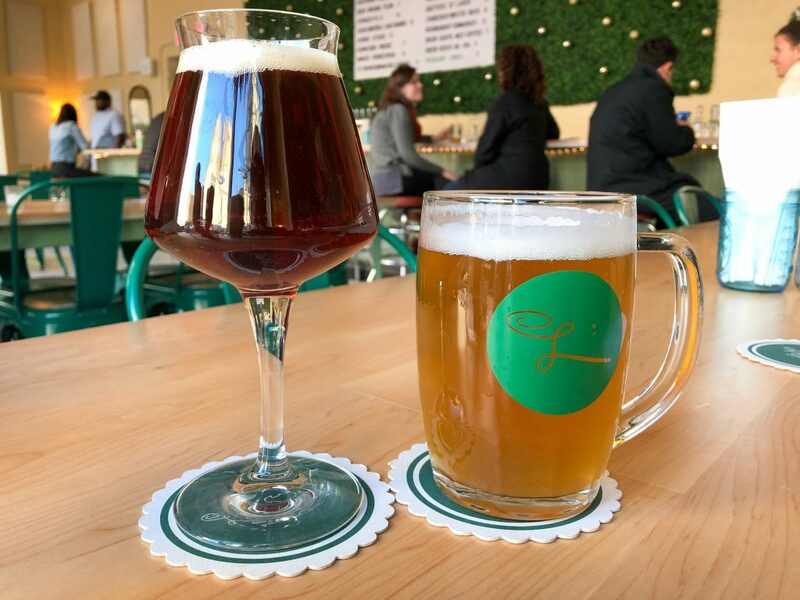 Lizzie, our server, got us started with a Czech lager, the Únětické Pivo 12° (4.9% abv), and a German doppelbock, the Einbecker Winter-Bock (7.5%). The Únětické Pivo 12° was served in a stein, which maximized its rich, earthy aroma. It was a hop-forward lager, but still with a sweet yeasty taste. The Einbecker Winter-Bock, served in a tulip glass, tasted rich with notes of cherry. My girlfriend compared it favorably to Tröegs’ Mad Elf Holiday Ale. We began round two with a Reissdorf Kölsch (4.8%) served in a ten-ounce lager glass. This was a slightly smaller pour than the other beers, but happy hour brought the $4 kölsch to two bucks—a bargain. It was refreshing, a little sour, and wheaty. On my way to the restroom, I asked Lizzie for a half-pour of the Austrian märzen. She forgot if I said märzen or kellerbier, so she brought us a half-pour of each, comping us for one, which was kind. The märzen, a Hofstetten Hochzeitsbier Von 1810 (6.3%), tasted of honey. The kellerbier, a St. Georgen Bräu (4.9%), tasted subtlety of grain. 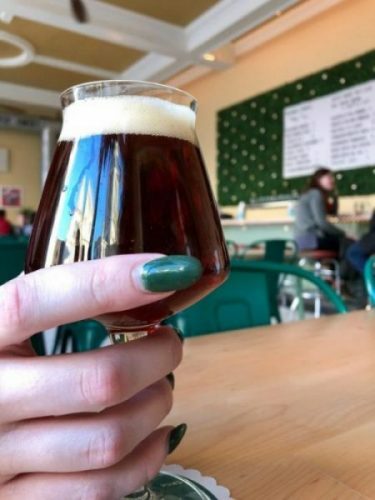 Draft prices range from $4 to $8 for full pours outside of happy hour. Wines can go as low as $9 for a glass of Riesling or as high as $95 for a bottle of champagne. The wine list features selections from Germany, France, Austria, and Italy. Patrons relax and enjoy basic and exotic libations in the cocktail and wine bar side of Lorelei. A chargrilled aroma wafted from the adjacent cocktail bar and kitchen. It had just opened at 5 p.m. We decided to move there to better experience its ambience. However, we could have stayed put and ordered our food in the beer hall, which was bumpin’. Now in the equally capable hands of server Joe, we ordered the Lorelei Pretzel and the Braised Lamb Pie. 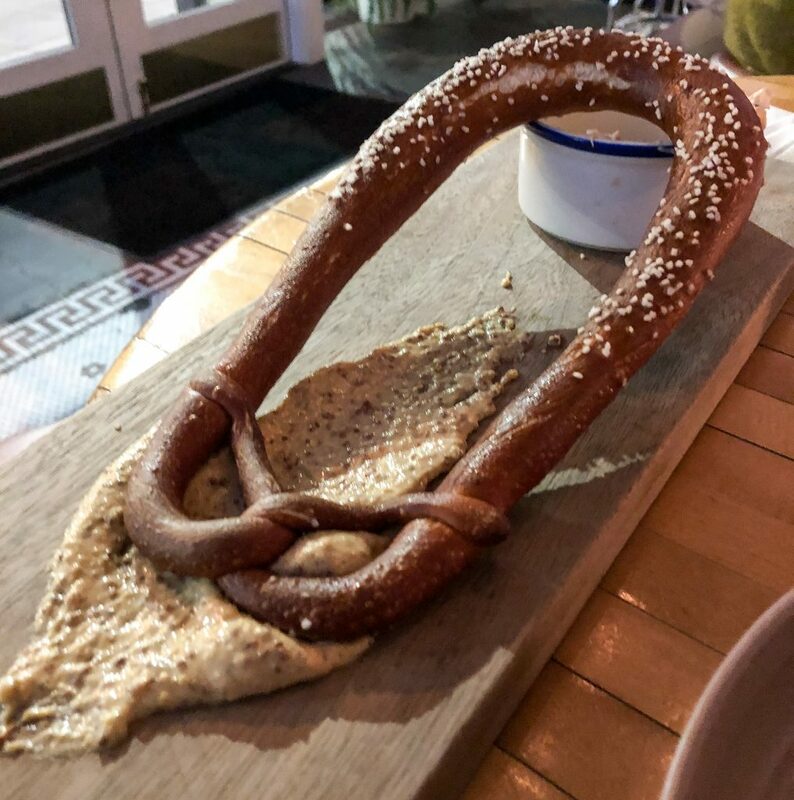 The pretzel, which is made fresh daily, was good as was the mustard. But it was the accompanying kielbasa-kraut cheese spread that took it to the next level. The pie was savory, full of lamb, and balanced with mint chutney, tamarind, and chickpeas. It came with a side of greens. 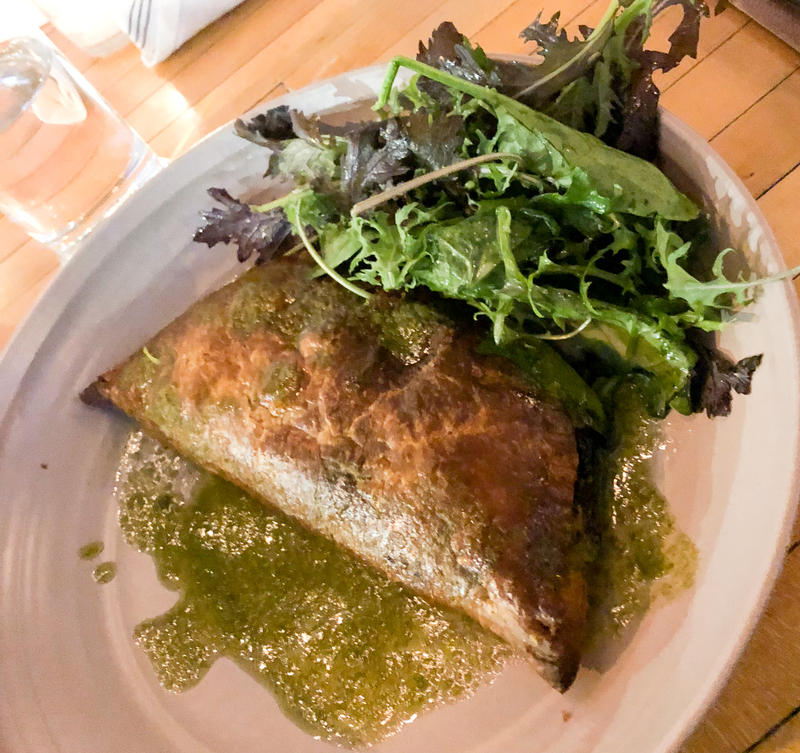 Executive Chef Jamilka Borges grew up in Puerto Rico, and empanadas inspired the hand pies on the menu, which also includes other appetizers, salads, sandwiches, and soups. We skipped dessert, but we were definitely tempted, especially by the slices of German Chocolate Cake. Instead, we split a signature cocktail, the Redhead Swizzle. According to Lorelei’s website, “[t]he cocktail menu integrates Alpine flavors, frequently from Germany, France, and northern Italy, into more familiar classic cocktail templates.” So for those who fear Jägermeister (like me), fear not, for this was strawberry-infused Jägermeister. 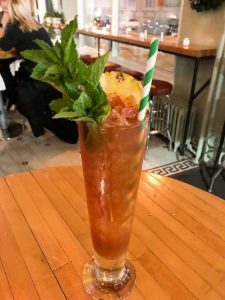 It gave the cocktail not only its redheaded hue but—along with peach, lime, ginger, and pineapple—a tropical, fruity flavor. Snacks, soups, and salads range in price from $6 to $12. Sandwiches and hand pies range from $10 to $13. 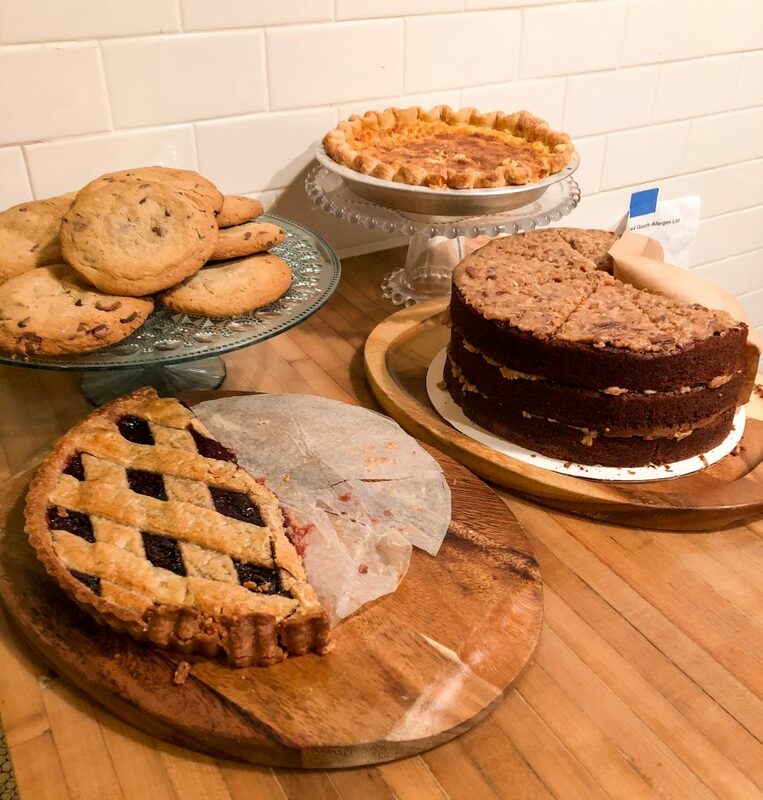 And desserts range from $3 to $9. Cocktails go for $10 to $12. My girlfriend remarked about how well we planned our visit: happy hour for discounted, quality European beers and then off to the other room for food and a cocktail. Because we arrived early, we snagged a parking space on nearby Baum Boulevard. I should note no music played while we were there—a nice break from the pumping bass lines that often haunt nightlife spots. Other happy hours include 5 to 6 p.m. Wednesday to Friday. There’s the usual deal on draft beer and wine as well as $3 off all classic cocktails. Some of the day’s dessert selections. And even if one misses happy hour, Lorelei is an all-around excellent place. The service is prompt. The glassware and silverware—spotless. The hall sells local brews, from Iron City to Brew Gentlemen, some on tap and others bottled. Additional libations include IPAs, draft Alpine gin and tonic, and German pear and apple hard cider. Beer glasses and T-shirts are also for sale. Both the beer hall and all of Lorelei are available to book for private events. There are also three restrooms: one for “gents,” one for “ladies,” and one unisex. For 2019, patrons can expect more gravity kegs. This is when the kegs are put into barrels which are put on the bar top and served there. “We like doing it in that kind of traditional style,” Kurzweg said. He also hopes to sell more Czech beer in the new year. We will return, for like the bar’s namesake siren, Lorelei is tough to resist. Lorelei sits directly across the street from East Liberty Presbyterian Church on Highland Avenue. 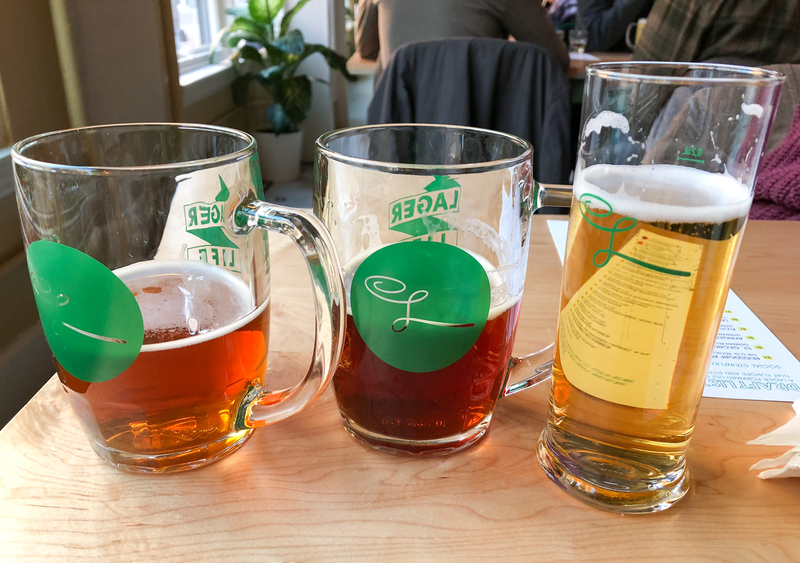 A trio of partially consumed beers, l. to r., the kellerbier, märzen, and kölsch. The beer hall side of Lorelei. 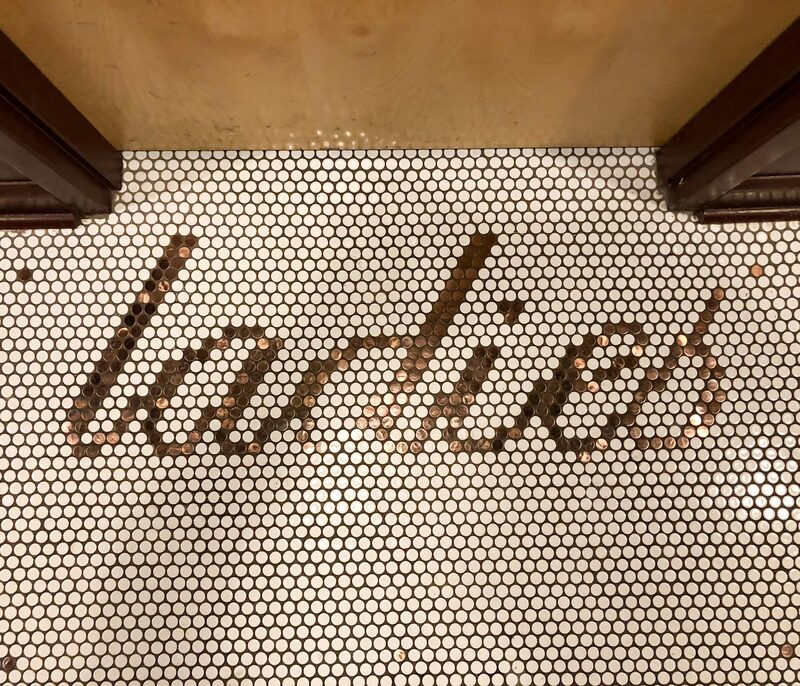 These may not be pennies from heaven but they do identify the Ladies and Gents bathrooms. My girlfriend keeps a firm grip on her Winter-Bock. Story and photos by Christopher Maggio, a Pittsburgh-based writer and editor.